A community can’t attract investment if it doesn’t have a clear sense of what it has to offer to a potential company or industry looking to locate there. That’s why the U.S. Economic Development Administration (EDA) has tools to help communities identify assets in their regions that will help to attract private investment: the National Excess Manufacturing Capacity Catalogue (NEXCAP) and the U.S. Cluster Mapping website. In the United States, there are hundreds of millions of square feet of nonproductive commercial, industrial, and manufacturing space. This space provides an opportunity for domestic companies to find manufacturing spaces as well as foreign companies looking to locate operations in the United States. However, information about this space can be incomplete and scattered. That’s where NEXCAP comes in. With funding from EDA, NEXCAP is uniquely and comprehensively cataloging these vacant manufacturing facilities, their assets, and those of the surrounding community. The searchable catalog offers companies seeking manufacturing production sites/facilities in the U.S. a complete and detailed overview of potential manufacturing sites. NEXCAP's site inventory and portal is populated with detailed profiles of the facilities and their host communities. It provides companies seeking locations with a toolkit of information to guide their business location and/or expansion decisions. This benefits the communities with properties by attracting investment and new, job creating industries. The NEXCAP portal is designed for users to create an account, save their searches, and be notified when new property listings are available. NEXCAP’s catalogue also includes an input process and tool that will match facilities with companies looking for space. So far, NEXCAP has developed a comprehensive inventory database of closed plants and sites in the eastern half of the United States, based on a consistent method and template. As the second year of the program begins, NEXCAP will expand its inventory to include closed plants and sites in the western part of the country, covering the entire United States. To-date, there have been more than 3,000 visits to the website from more than 1,000 unique users in 70 countries across the globe. Several companies have already found new homes in these previously empty facilities. Since February, 2013, WCR, Inc., which manufactures heat exchanges in locations across the globe, has set up shop in 60,000 sq. ft. of the former GM Assembly Plant in Moraine, Ohio. In Lorain, Ohio, a former 300,000 sq. ft. Ford assembly plant has been transformed into the home of Trademark Global, a mass market internet retailer. In June, EDA launched its Cluster Mapping website. EDA supported the U.S. Cluster Map & Registry Project at the Harvard Business School’s Institute for Strategy and Competitiveness (ISC). Clusters are geographic concentrations of interconnected industries and supportive organizations that make regions uniquely competitive for jobs and private investment – like the automotive cluster in the South and the biotech cluster in the Northeast. Clusters thrive and are critical in both urban and rural communities and provide a framework for understanding regional competitiveness and drivers of private investment and job creation. They also help identify and prioritize opportunities for public investment and provide a platform for linking, leveraging, and aligning federal or state programs to get a better return on investment of taxpayer funds. Every regional economy has its own distinct profile of clusters, and this tool helps communities identify theirs. The U.S. 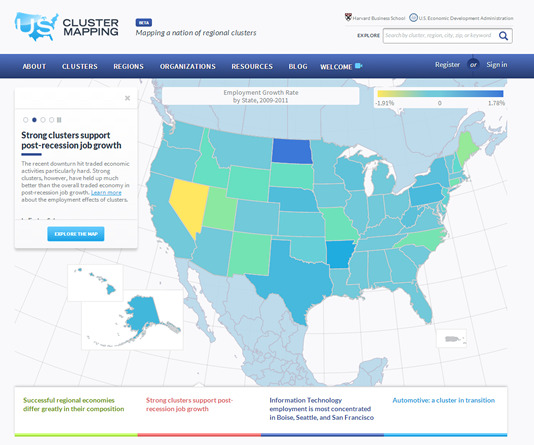 Cluster Mapping website provides new insights on the role of clusters in driving regional economic outcomes. It looks at the regions whose clusters are denser than average to identify national clusters. Making this cluster data available will assist communities seeking to do economic development and attract investment, businesses looking to expand, and researchers hoping to better understand regional economic drivers. The tool is already being put to use. From Minnesota to South Carolina the tool has been used to identify key economic opportunities for communities in chemical processing, large construction machinery, and even the textile industry. In Dalton, Georgia, Dalton State College is using mapping data to analyze regional business clusters. After sifting through economic information about key sectors, from chemical manufacturing to building materials to transportation infrastructure, Dalton tailored an even more successful and targeted economic development strategy. Getting the right data into the hands of the right community leaders and strategic investors has allowed Georgia’s communities to recruit new companies and ultimately foster whole new industries. In addition to NEXCAP and the Cluster Mapping website, EDA has several other tools available to communities seeking to attract investment and grow their economies. To learn more, visit www.eda.gov.